Our fans’ panel look ahead to Leeds United’s home clash with QPR. If you’re anything like me you’ll still be on bit of a high following the weekend’s impressive win in the Steel City. So too will the Leeds United squad as they welcome mid-table QPR to Elland Road. The Rs recent form has been erratic to say the least, scoring nine and conceding nine in their last four games. Meanwhile, United have shown this season that their defence is one of the best in the division, and at the other end, the goals continue to flow. Leeds will be hoping that if their make-shift defence remains strong, the rest will take care of itself. Many will be hoping to see Jack Clarke rewarded for his lively recent performances, while Kemar Roofe will be looking to follow up his hat-trick against QPR last season. We’re entering the busy Christmas period where many predicted that United’s form might start to dip, but with three home games to come, home advantage may well be crucial. This is as good a game as any to keep the ball rolling. Prediction: Leeds United 2 QPR 1. As the tantalising prospect of promotion looks ever more plausible, every upcoming game seems to take on greater significance than the one before! It’s probably the fear that, having hung in there for so long, it will suddenly come crashing down like it has done so often in the past. The visit of QPR thus becomes another game of huge importance. The Rs had a dire start to the season, losing their opening four games, including a 7-1 spanking at West Brom but since then they’ve turned things round and lost only four more of their last 16. They currently sit safely in mid-table in both the actual and current form rankings. Their away form is mid-table too (W3, D3, L4) with their most recent trips – Stoke and Rotherham- both ending 2-2. Against Hull, at last weekend, they surprisingly lost 3-2 despite dominating the game. QPR are expected to play a 4-2-3-1 set-up, with Nahki Wells up front, so Leeds should play their usual 4-1-4-1, requiring only two centre-backs… a good job since that’s all we have left! Prediction: Leeds United 2 QPR 0. There was a fan chant a couple of seasons ago that referenced the entire United back line over and over again on a loop. This season we may as well sing the injury list from the stands such is the extent of our absences, particularly in defence. Pontus Jansson had only been back 21 minutes before his short-lived reunification with Liam Cooper was over and it was now Cooper’s turn to hobble off for a spell on the sidelines. The news that Stuart Dallas will be out for six weeks almost beggars belief. That’s Luke Ayling, Gaetano Berardi and Dallas all out and Lewie Coyle away on loan meaning that we are onto our fifth choice at right-back tomorrow. December will be a test but we’ve got some very winnable games, including tomorrow’s. So far everybody who has been thrown into the mix has done the job this season so we have no reason not to expect the same again. 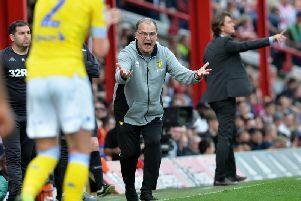 Leeds United are sitting comfortably in second place in the Championship with a ‘siege’ mentality that seems to shake off the problems that recent injuries has caused. QPR are of course managed by ex-England manager Steve McClaren who knows this division like the back of his hand, but his team is hard to fathom. They have had decent results away from home and beat Villa 1-0 at home but have struggled against teams you’d expect them to beat. Last week they were beaten 3-2 at home by Hull City who have struggled most of the season. It is a strange division mind you, coupon-busting results happen weekly. Nearly every player in the first team has been out injured this season, I daren’t mention the ones who’ve so far escaped the jinx at the club because without doubt they will end up out injured too! A change that is wanted by the fans is the immensely talented Jack Clarke coming into the starting XI for Gjanni Alioski, the youngster has impressed in every game he has been introduced into. Alioski on the other hand has offered little and may benefit from a game or two on the bench. The youngster is rumoured to have been watched numerous times by Manchester City. Most people will be putting this game down as a home banker but they probably did the same for the Birmingham City game and that showed how if you don’t turn up you can easily be ‘turned over’ by the opposition. I expect Leeds to put at least a couple of goals past QPR. United go into their game with QPR battered but unbowed after their epic result at Bramall Lane. Although the loss of Liam Cooper cannot be trivialised, there seems to be a confident air about. This permeates down through the team from our head coach who, publicly at any rate, will not seek or accept any excuses. I can think of at least a dozen Championship managers who would be getting their alibis in early. Imagine the doleful, martyred expressions as they face the camera and try to deflect any possible blame that might come their way. Of course, having a managerial whine does work sometimes – ask Steve McClaren. After QPR had a disastrous start to the season he was allowed to make three good loan signings in Tomer Hemed, Nahki Wells and Geoff Cameron and their season picked up. So much so that until the international break they were one of the form teams. However, since then they have taken two points from three games. It’s getting to be like that Monty Python scene when the knight keeps coming back for more, despite limbs being hacked away. The points rack up but so do the injuries. Leeds have a similar track record with right-backs as Spinal Tap had with drummers. One imagines Jamie Shackleton is looking to buy a rabbit’s foot online. He looks to be the next man up in the berth. Centre-backs too are as thin on the ground as members of The Oliver Langford Fan Club. I expect United will cope, the callow reserves will step up and the side will find a way to win. QPR can be useful or useless depending on their mood but I suspect that they will be harbouring thoughts that a respectable defeat will be somewhat a victory. Formerly of this parish, Mathieu Smith is likely to feature for the Rs and we at least have Pontus Jansson to guard against his aerial threat. Where Leeds have a dearth of availability at the back they have abundance going forward and this could be the game when someone gets a drubbing. Prediction: Leeds United 4 QPR 1.